Compatible with WooCommerce 3.4.x, WooCommerce 3.3.x, WooCommerce 3.2.x, WooCommerce 3.1.x, WooCommerce 3.0.x. Guard Master has been tested with browsers IE10, IE11, Firefox, Safari, Opera, Chrome, Edge. 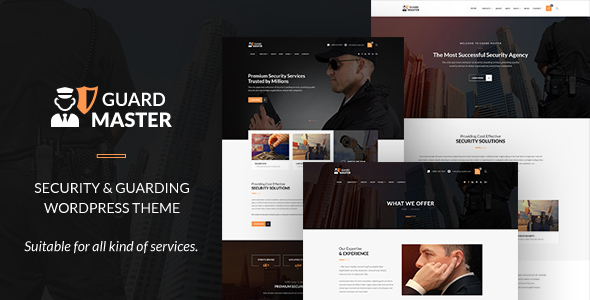 Theme Guard Master - Security Guards WordPress Theme has the following features: Stunning Design., Very well structured pages., WPBakery Drag drop page builder.